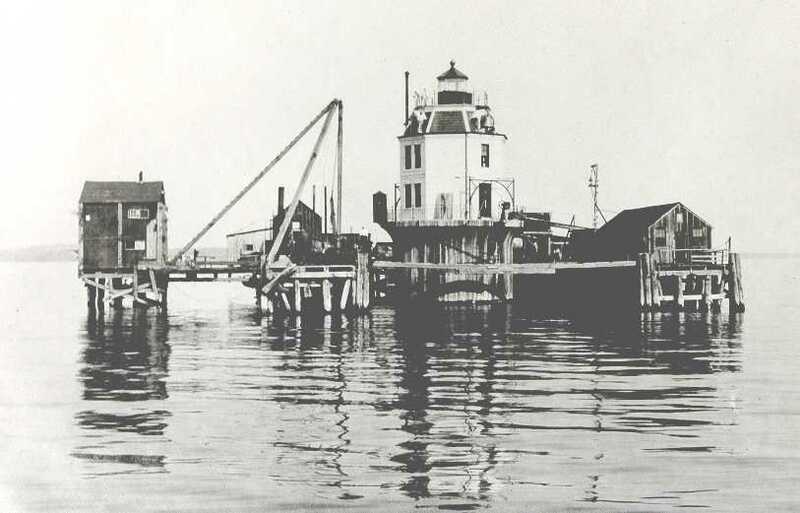 Constructing the Baltimore Lighthouse proved to be one of the more difficult tasks ever undertaken in the interests of establishing an aid to navigation in the United States. When the Lighthouse Board requested $60,000 in 1890 for a beacon to mark the entry point of the Baltimore Channel near the mouth of the Magothy River, it had some idea of what it was getting into: “On account of the impressible character of the shoal, and the liability to damage or destruction by fields of moving ice, no light-house, other than an expensive one, can be made permanent.” The difficulty of the task delayed completion of the lighthouse until eighteen years after the initial request for funding. Congress granted the Board’s first request for funding in 1894, and the site was subsequently examined by boring deep into the shoal at the selected site. The results of these tests were discouraging as they revealed that a “layer of soft mud extended 55 feet below the surface of the shoal.” The Board concluded that while sinking a foundation through this deep mud would be “somewhat difficult” for the allotted $60,000, a lighthouse resting on a screwpile foundation might be possible. In 1899, however, the failure of an experimental disk pile placed at the site doomed the screwpile option. The Board was led to conclude “that the expense of building a light-station in the 55 feet of semifluid mud which overlays the sandy bottom” would cost twice as much as the original request and would require a caisson foundation capable of resisting 100 mph winds, 30,000 pounds of ice pressure per square foot and a three mph current. The Board made their new recommendation annually to Congress three times, until in 1902 the entire amount was approved. Bidding for the job was opened in 1903. Somewhat ominously, only one bid came in and that was $80,000 over budget. The sole bid was rejected, but Congress approved yet another $60,000 to make the project feasible, bringing the grand total of allocated money to $180,000. In the next round of bidding, William H. Flaherty was the only participant. He and his partner, Frederick Martin Lande, had experience building caisson lighthouses and by cutting back on certain material allotments were able to submit a bid below the budgeted amount. The metalwork for the lighthouse was contracted to a company in Atlanta, Georgia, which completed the task in 1904. In September of that year, a portion of the thirty-foot diameter metal cylinder that would serve as the foundation was launched from the Lazaretto Lighthouse Depot and towed to the site. A Baltimore newspaper commented that “the erecting of this big lighthouse will be one of the most difficult tasks ever undertaken by lighthouse builders.” Indeed, two days after its arrival heavy seas filled the cylinder and knocked it off kilter by about seven feet. At this point, the caisson had been sunk a mere eight feet into the shoal. The contractor left the site to gather additional materials and returned in October only to watch as a bad storm caused the cylinder to overturn on its side. Flaherty left the scene once more, and this time he did not come back. The government sued the contractor, and the insurance company which had bonded Flaherty was forced to step in and complete the job. The United States Fidelity and Guaranty Company tried to bring the caisson back to level over the next three years. First they removed over half of the 120 iron plates attached to the structure, then they built a U-shaped pier around the lighthouse grounds and brought in counterbalancing equipment, which consisted of a steam engine, air compressors, water tanks, a hoisting machine, A-frames and temporary quarters for workers. By 1907, the insurance company had righted the caisson off the horizontal using 80 tons of weights and pumps to remove the mud from underneath one side of the cylinder. They then proceeded to reattach the plates and sink the caisson the required 82 feet beneath the high water mark. The Lighthouse Board’s 1908 report remarked that “the righting of the caisson and the sinking of the foundation cylinder into its required position have been performed with remarkable success.” The top of the caisson foundation flares out to support an octagonal, two-story brick structure topped by a mansard roof originally covered with colorful slate tiles. The first floor provided the main living space for the keeper, including a kitchen and sitting room. The kitchen was equipped with a hand pump to bring up water from the cistern housed in the top portion of the caisson. Just outside a cast-iron structure resembling a guard shack and cantilevered over the water served as the station’s privy. Two bedrooms were located on the second floor, while a small watch room was located in the mansard roof. An octagonal lantern room, topped with a copper roof, ventilator ball, and lightning spindle finish of the lighthouse. At long last, the Baltimore Lighthouse was commissioned on October 1, 1908, with the lighting of its fourth-order Fresnel lens. Like most lighthouses, Baltimore has suffered since automation removed its live-in caretakers. A 1983 Coast Guard Report, made in preparation for the extensive “Operation Spruce Up,” revealed how bad the damage had become. Besides the near ubiquitous water damage, unsealed windows had led to proliferation of pigeons, bird eggs, and guano “several inches thick on all decks and even the stairway.” The lantern glass panes and the lens, serving as a beautiful beacon, also inevitably attracted their share of bullets. Vandals had also left their mark on the wooden door and had even tried to burn the interior of the lighthouse. To preserve the lighthouse, the windows were filled in with bricks, the wooden door was replaced with a steel one, acrylic panes were installed in the lantern and the access ladders were put beyond normal human reach. In 1988, the commander of the Coast Guard’s lighthouse maintenance ship Red Birch expressed concern for the condition of the Baltimore structure. While he acknowledged that the boat davits and the iron outhouse no longer had any utility, he still recommended painting them in the interests of “historical significance.” Between 1989 and 1990, the Red Birch’s efforts included sandblasting the caisson, caulking and painting the masonry and replacing the water-logged timbers of the lantern floor with tongue and groove boards. 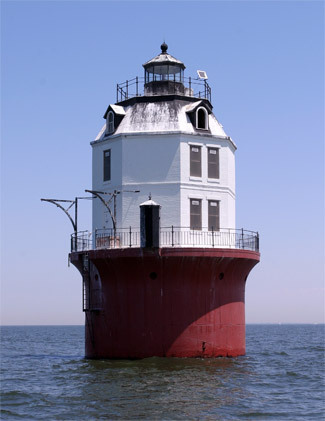 Baltimore Harbor Lighthouse was put up for public auction by the Real Property Disposal Division of the General Services Administration after no non-profit groups expressed interested in assuming responsibility for the structure when it was offered in 2004. With maintenance and repair costs escalating as our nation’s historic lighthouses age, private ownership is increasingly being turned to as a means to preserve them. The auction ended on June 28, 2006 with a final bid of $260,000. The new owner, BHL, LLC of Annapolis, MD is a partnership of private citizens (four couples), who are committed to the preservation and restoration of Baltimore Harbor Light. The terms of the sale dictate that the Coast Guard be granted access to the lighthouse for occasional checkups on the still-active light. The owners eventually plan on sharing their “privately owned museum” with the public through evenings or overnights at the lighthouse.